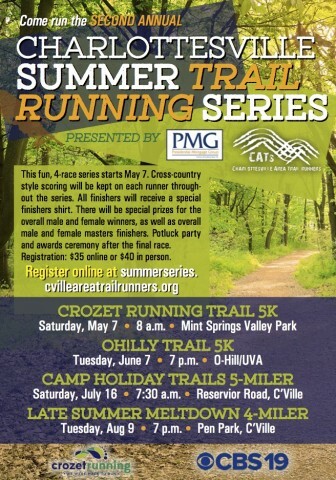 Join us for the 2nd Charlottesville Summer Trail Running Series for 2016 consisting of four races on trails in and around Charlottesville and Crozet, VA. The distances for the races vary from 5K to 5 miles and are open to all ages, skill levels, and speeds (walkers are welcome too). Barbeque to follow race with series awards and fun! Race entry for the full series is $35 (online) / $40 in person. We can’t wait for the series to begin. Presidential Mortgage Group is proud to be a sponsor this year. Stay tuned for bonus prizes. I need to contact the event organizer, but can’t find contact info.